I’m going to give you a way to work gently and firmly with yourself and your family so that the coaching happens regularly and you help your child succeed at school. Stephen Covey in his book ‘First things first’ talks about the difference between the have’s (“If only I had…”) and the be’s (“I can be…”). He and I both agree that focusing on what you don’t like (if only I had….) is disempowering, and that focusing on what you can do to help your child succeed at school is proactive and empowering. He suggests you examine what you can do instead of worrying about things over which you have no control. First notice all your concerns about helping your child succeed at school. Then, among those concerns, determine where you can take action to help your child do well at school. 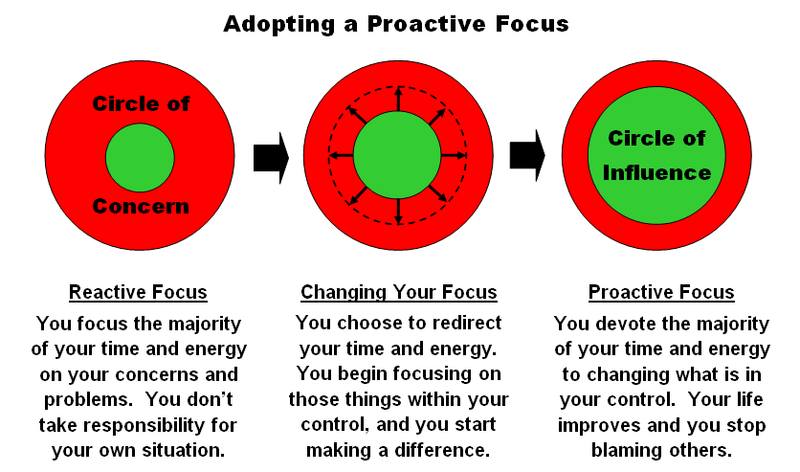 When we think of ways we can act, our circle of influence will enlarge and our circle of concern will shrink. How to expand your circle of influence. Create coaching goals to help your child succeed at school that are exciting, achievable, and interesting. Ask yourself the following simple but powerful questions in order and write down your thoughts as they pop into your mind. Why do I want my child to improve these skills? Keep asking ‘why?’ or ‘why else?’ to each of your answers until you know you have discovered the core reason you deeply wish your child to improve those particular skills. You will know when you find the core reason. You will feel full of energy, urgency, and excitement. What can I do to coach my child to improve ……………skills? Write down all the things you could do. Write down even the ones you might think won’t work. Don’t judge any of your ideas until they are all written down. When you can’t think of a single more idea about what you can do – order your ideas. You can write numbers besides them in order of importance and ‘do-ability’. The other ideas about helping your child succeed at school might be useful later, so keep them too. I’ve been impressed with the book on ways to set goals we will achieve calledThe Magic Lamp . Keith Ellis has wonderful ideas. Here is one of them. What do I need to change so that my child and I can coach regularly together during the week? Write down only the things you have the power to change. We can only take responsibility for our own actions, and work within our own circle of influence. When you change how you are thinking and acting, those around you change too. Here is a website that summarises his ideas. Stephen Covey calls this expanding your circle of influence so that your circle of concern will over time become smaller. My website has some good ideas to help you set goals so that you help your child succeed at school. Check out more of my ideas on how to help your children become excellent students at this blog site here. Posted by annethecoach on 23 April, 2013 in coaching, goal-setting and tagged coaching your child to succeed at school, help your child succeed at school, Mathematics, teaching reading, writing skills. Great blog! Not enough people ask themselves why! Thanks Johnny. Why is the really important thing to ask before you commit to a new path. I can tell by your blogs you know that really well! !